Murder by Gaslight: Unique Murder in Missouri. About two months ago Dean and Brown had quarreled, but shortly after made it up, and apparently became friends again. On Monday night there was a dance at New Market, at the house of a man by the name of Smith. 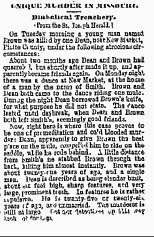 Brown and Dean both came to the dance riding one mule. During the night Dean borrowed Brown’s knife, for what purpose he did not state. The dance lasted until daybreak, when Dean and Brown both left Smith’s, seemingly good friends. Now, right here is where this case proves to be one of premeditation and cold blooded murder; Dean, apparently to give Brown the best place on the mule, compelled, him to ride on the saddle while he rode behind. A little distance from Smith’s he stabbed Brown through the back, killing him almost instantly. Brown was about twenty-one years of age, and a single man. Dean is described as being slender built, about six feet high, sharp feature, and very large, prominent teeth. In features he is rather repulsive. He is twenty-five or twenty-six years of age, and unmarried. The murderer is still at large. Let our detectives up this way look out for him. "Unique Murder in Missouri." Cincinnati Daily Enquirer, 2 Jan 1871: 2.